A global survey conducted by EF Education First ranked Thailand at number 55 out of 60 countries for English language proficiency. Looks like us EFL teachers have a lot more work to do to help them to play catch up! 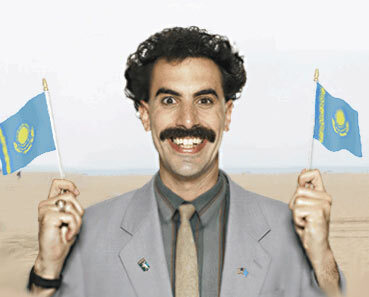 OK, so I know Borat is fictional… but, still – for the lol’s. Considering the high level of tourism and the approach of the formation of ASEAN (Association of South East Asian Nations), whose official language is English, Thailand will need to pull their finger out and up their English game pretty sharpish. The world is becoming a smaller place, where being proficient in English is key to success. Thailand has spent a long time trying to protect its culture, ways of life and its people – but has that been at the cost of falling behind the rest of the globe? Malaysia, which is literally less than an hour from where I sit typing this right now, ranked 12th. I could drive there right now and be able to fully converse with the guy selling me coffee! Not that I expect or even want to do that in Thailand, but it’s insane that within such a short distance there can be such a massive difference, and it’s all down to education and more importantly, general attitude to needing (and wanting) to learn English. So many of my students haven’t even realised the importance of English yet, and so they don’t want to learn. But then again, when they are probably going to take over their father’s rubber plantation and stay living in their little town where English isn’t seen or heard other than for a few lessons a week with the token farang teacher, do they really need to learn it? Before we force feed the language down their necks, we need to encourage the students to come to their own conclusions about why English is important to them, if it is at all. Click here to read the full article that brought this to my attention. And here for the full survey results. Posted on November 7, 2013 October 11, 2014 by cornishkyliePosted in Reflections, Teaching, ThailandTagged efl, English, English language, English proficiency, esl, global, language, nablopomo, postaday, survey, TEFL, Thailand, world. Previous Previous post: Under construction! Next Next post: Computer says NO. Thai men probably do it for me about the same as Latvian men 😉 This online dating thing is a bit of a revelation – turns out they’re all married. Or look like Uncle Fester 😉 Not great options!